This section, which is still in development, provides notes related to my DNA research for my maternal ancestors. My mothers parents were Tom Norman and Jessie Norman née Snelgrove. Thomas William Norman was born in Indian Harbour, Labrador in 1874 but lived most of his life in Bay Roberts. Tom married Jessie Snelgrove from Bears Cove, Harbour Grace in 1900. My Snelgrove ancestors are well documented and account for a disproportionate number of my DNA matches while my Norman family tree ends with Tom’s parents (my great grandparents) who were Abraham Norman and his wife Harriett Cumby /Comby / Camby (DNA links to Crummey). Abraham was born in Bay Roberts in 1838 and was living there in 1865 but in 1870 he married Harriett at Battle Harbour, Labrador. Abraham was still listed as living in Bay Roberts in 1871 so he was likely fishing in Labrador that summer and married Harriett before returning home to Bay Roberts or possibly to her home. In March 1873 , the year before Thomas was born in Indian Harbour, Abraham and Harriett Norman had a daughter Elizabeth born at Griquet (east side of northern peninsular of Newfoundland). Griquet is situated on the French Shore which was an area of northern eastern Newfoundland where the French had exclusive fishing rights from 1713 up to 1904. Around the time that Elizabeth was born fishermen from Conception Bay were starting to fish for salmon and herring in this area and the Newfoundland Government was pressuring the British Government to end the Treaty. As part of their case in 1873 the Newfoundland Government conducted a survey of inhabitants on the French Shore (Published in the Journal of the House of Assembly of Newfoundland for 1873). This survey listed an Abraham Norman with a wife and one child living at Griquet. Elizabeth was born in March 1873 which suggest Abraham was wintering in Griquet. 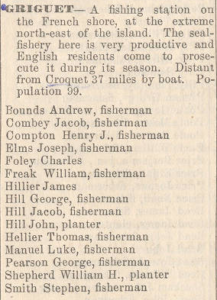 There was a Jacob Combey listed as a resident of Griguet in 1871 (but not before or after) so this could be Harriet’s father and if so she may have been staying there while she was waiting to give birth. There were other Normans living on the French Shore in 1873 including: William Norman with a wife and 1 child at Great Braha (South of St. Anthony) and Richard Norman with a wife and 5 children at Flowers Cove (AKA French Island Harbour) . This Richard was Richard William Norman, the son of James and Harriett, who was baptized at Brigus 1n 1842. Richard married Johanna Whalen in 1863 and they had a daughter baptized at French Island Harbour in 1874. This Richard was brother in Law to William Bush Bendell who was the agent for the merchants T. & D. Slade at Battle Harbour. In addition, a Henry Norman born 1849 at Clark’s Beach and a descendant of the Normans of Brigus and Cupids was living at Pacquet (also on the French Shore) during the late 1800s. Thomas was born at Indian Harbour, Labrador in August 1874. Indian Harbour was the Labrador base for Nathan Norman (1809 – 1883) a Brigus merchant who had major operations in Labrador. Abraham and Harriett had another daughter Susanna baptized at Battle Harbour in 1876 and a son Robert John baptized in Battle Harbour in 1878. Robert John was likely the John referenced in Abraham’s Will dated 1905 and the John buried at Bay Roberts in 1947. NORMAN John March 20th 1947 68 years Beloved husband of Ruth Norman. You suffered much, you murmured not, We watched you night and day; Until at last with aching hearts, We saw you pass away. There was another son Henry referenced in Abraham’s Will who was likely the Henry Norman born in Bay Roberts in 1886. From the historical data is clear that in the 1870s Abraham, like other fishermen from Conception Bay, was involved in the fishery along the French Shore and in southern Labrador (see my report on Labrador Connections). a large number of 5th cousin matches. In addition, there were a number of 4th and 5th cousin matches to the Normore name in Newfoundland, especially from Bell Island. The Normore and Norman names were sometimes used interchangeably in early Newfoundland records and this may be another branch of the same family or I might have a separate link to the Normore family (see more discussion of these links below). Bell Island – Catherine Normore, Census 1794/95 born in Newfoundland. My Norman DNA matches suggest links to several Normans from Brigus. I also get DNA links that point to the Noels /Newells of Brigus (same family with Noel/ Noll being common early spelling that gradually changed to Newell) and general distant DNA links to other early (pre 1800) families from Brigus (e.g Antle, Roberts, Wilcox and Bartlett). Samuel Norman, married, 6 children, 5 servants. In addition there was a third William Norman who drowned with his son John in 1813 and a forth who was married with two children and living in Bareneed. I have made attempts to track the numerous DNA matches pointing back to the Normans in my family tree but only have limited confidence in the various branches and have found a number of cases where a branch also has other non Norman connections to me. Overall my best guess is that I am descended from John Norman (1759-1801) who married Grace Walker (She later married John Antle). 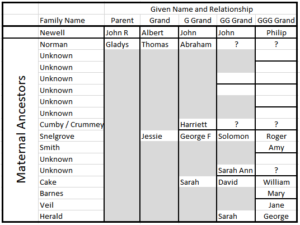 Assuming this is correct then John and Grace would be my 3 X great grandparents. I also get DNA links to William Norman b. 1786, who has Dawe in tree which may be source of the match, and Mary Norman b. 1757, who has members of the French family in her tree which may be a potential non Norman link. I have several potential candidates for my 2X great grandfather who would have been one of John’s sons (Henry b. c. 1795, William b. c. 1796, John b. 1798 or James b. c. 1800) . I have solid evidence for John being a son of John and Grace, the others are based on circumstantial evidence and /or other trees. John is the only one of these with no DNA links but he appears to be C of E which fits with my family while the others are Methodist (the most common religion for Brigus Normans). In addition, John has a link to Bay Roberts through his wife Mary Jemima Badcock. Sorting out my Brigus connections is further confused by a number of DNA connections to Noels, Noalls and Newells of Brigus (same family where spelling of family name changed over time). For example, Stephen Noall b 1826 likely a son of John Noall b 1798. One non Brigus Norman family is interesting in terms of its connection to another family, (Oldford, Holford) that has a large number of DNA matches. This is the family of Joseph Norman of Greenspond who married Rebecca Oldford in 1837. A significant number of my DNA matches are associated with Sara Jane Porter (1760-1849) from Elliston who married George Oldford of Trinity in 1779. My paternal great grandmother was a Porter and George Oldford’s mother was Mary Hannah Newell from Trinity. I have attempted to map out this family in my tree for the Trinity Newells and it appears likely that Rebecca was part of the same family; however, I can’t find any DNA connections with Joseph’s family. or the two families are separate and that I have a separate connection to the Normore family. I have discounted the first option based on the number of distant DNA links I get to the Norman family of Brigus. My Normore matches point to Bell Island with a number of these DNA matches having Catherine Normore in their tree. Catherine was born on Bell Island in 1802 and was the daughter of Henry Normore of Bell Island; Catherine married John Bennett in Dec. 1822. Catherine was the brother of Oliver Normore of Adam’ Cove (Conception Bay North) and is referenced in his Will probated in 1831 (see also the 1913 Will of Oliver Bennett who was Catherine’s son). The Charles Normore of Upper Island Cove, Conception Bay North (see Plantation Book c. 1805) was also likely connected to the Bell Island Normores. These Normores of Conception Bay North may be linked to my mother’s other ancestors (Snelgrove, Cake, Herald, Comby/ Crummey, Smith) from Conception Bay North and this might explain my DNA connection.